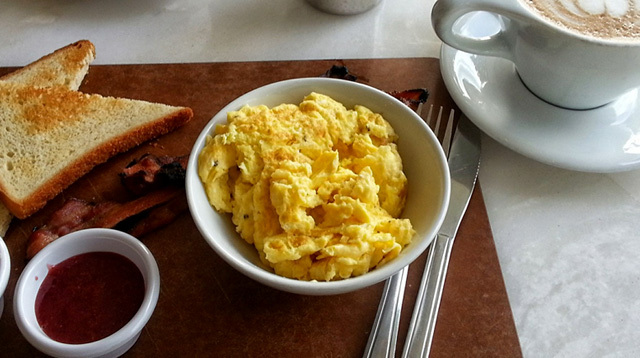 There are many ways to make the perfect scrambled egg. Food52 lists three: the low and slow method that yields creamy custard-y eggs with tiny curds; the rogue method that yields fluffy eggs with cooked whites and runny yolks; and the classic way that brings soft, fluffy eggs with big curds. Gordon Ramsay also has his own which of course looks deliciously creamy. But now you can have creamy scrambled eggs super fast! As in 15 seconds fast, which means to say you cook in high heat. I know what you’re thinking: “Impossible! Cooking your eggs too fast and hot will dry them up. Isn’t the low and slow the only way?” Not when you add cornstarch! Whisk milk and cornstarch together first before putting the mixture into your bowl of unbeaten eggs. You can view the next steps here. The logic behind this method is that cornstarch keeps the egg’s proteins together, so the egg doesn’t lose its moisture. Perfect! Now you have no reason to be useless in the kitchen or skip a meal from being busy.